In this day and age, there isn’t time to sit and watch what happens in your market. If you want to succeed, you need to take control of your own destiny. Most CEOs realize this, they often scramble for ideas on how to improve their operations and, too often, jump on the bandwagon of the latest fad with the hope that it will solve their problems or give them an edge over their competitors. They have heard the stories from their peers on the golf course or the tennis club. They have read the articles in magazines, they may even have spoken to a smooth talking consultant; all singing the praises of the latest “revolution” in productivity and lower cost. The more they think about it the better it sounds. One classic example goes back to the late ‘90s, when the 6 Sigma methodology became widely seen as the Holy Grail of business improvement. Many people thought: “If companies like GE can be successful with 6 Sigma than why shouldn’t we?” What a lot of people learned, though, is that there is no point in learning 6 Sigma if you don’t have any data to process. And, of course, that success isn’t measured in the number of, say, trained Black Belts. Success appears as an increase in bottom-line results. So before you sign up your organisation to the next revolution you need to ensure the right conditions are in place, that the grounds have been plowed and fertile so the seeds you will plant through the new approach and methodology will have the best chance to grow. The biggest killer of such initiatives is the lack of time. If your organisation operates in fire fighting mode your people are busy running from one emergency to the next. It is very difficult for them to find the time to sit down and analyse a problem to identify it’s root causes. It’s like the story of the lumberjack who was so busy cutting down trees that he didn’t have time to sharpen his saw. Besides, the reactive nature of the organisational dynamics make it difficult for people to accept the proactive approach of the new methodologies; it goes against the organisational culture of rewarding people who solve problems when they happen rather than rewarding people who anticipate and take actions to avoid problems altogether. This is why your journey to Operational Excellence needs to start with the basics: Planning, Execution and Follow-Up. By forcing people to think about the future you automatically change the organisational dynamics away from fire fighting to proactive actions. This may seem obvious, but you’d be amazed to find how many companies operate without one or two of the three. Execution is a given—without execution, there is no revenue. And every company engages in some degree of Planning, whether it’s in budgeting, sales or logistics. How ‘granular’ that planning is, and/or how much room for improvement is built into that process, are two different questions. It is in Follow-Up that most organizations stumble. There often just seems not to be enough time to do a proper review of the Planning and Execution, let alone perform root causes analyses on the deviation between what you planned to make and what you really made. People forget that deviations are golden opportunities to learn, improve and save time. But I guess this is also nothing new, most managers will regularly look at deviations to understand performance. There is even a name for this: Management by Exceptions. Note that it is one thing for managers to practice Management by Exceptions; it is another when operators do it. In my experience, to achieve the next level of organizational maturity, one needs to look at plan deviation, from management to the operators. If you can get your shop floor operators to apply the same techniques, then you will have made a huge jump in organizational maturity. Empowering employees to analyze deviations and make decisions without consulting their superiors (within their freedom box) not only gives employees more job satisfaction, it tightens the control of your operation and produces better results. First I must apologize for the long absence of this blog. Facts are, I just lost my groove. So I reflected of the events in order to draw a lesson that I could share with everyone. During my analysis, I realize the importance of the habit. Sure, nearly every self-improvement book theses days peaches the importance of the habit, but it only when you have experienced it yourself that you truly understand the effects of habits have on your productivity. When I started my blog some of my friends that already warned me about starting strong and quickly running out of steam. “The first three are easy, maintaining the pace is the real challenge”. But I was not to be fazed; I have discovered a good rhythm and created a habit. By the time November came around I have consistently delivered and I was proud of myself. The only problem now was that my environment surrounding my habits had changed. You see I have discovered that my most productive time is early in the morning; and we are fortunate to have a wonderful terrace where I like to sit and, depending on the time of year, watch the sunrise. These moments, alone and surrounded by nature, are truly priceless to me and where I am in my most productive state. The only problem now was the temperature. When the snow came, even my jacket could not save me, it just made no sense to be sitting outside any more. Then of course came Christmas and everything that comes with it, many distractions and activities, but I still managed to get one article out. However by the time January rolled around I had completely lost my groove. Not only was it to cold now, and the snow firmly controlled the terrace, I had started a new project which required me to drive long distances every week and there just did not remain enough time for the blog. This just happened to be the time, when I found out about podcasts. One but one particular podcast, “accidental creative” by Todd Henry, gave me some great insights about building habits and how to integrate my new work life with my creative side and my ability to deliver, quality material on a regular basis. In fact I was so impressed by his podcast that I bought his book “the accidental creative”. The insight that Todd shared in his book is that often people under pressure, who generally can’t find enough hours in the day, need to perhaps add something to their routine rather than cut back on their activities. That something is a “point of reflection”. By stepping back and going through your plan of activities of the day you can correct your focus and increase the amount of time you are most effective, by rationalizing the urge to stray from the task at hand. This simple exercise will allow you to challenge your behavior and maintain a much higher level of focus. By increasing your awareness of distractions, over time it even allows you to alter your behavior and sustainably increase your productivity. Make a plan of your activities everyday and take a few minutes each hour to review your plan. Make corrections as you see fit to maximize your outputs. You will also need to create the right environment as to minimize distractions. For example: I write on a piece of paper as not to be distracted by the lure of email; man’s instinct is to respond to the stimulation of that familiar email “ping”, as you sit there wondering who sent me an email. No having a computer in front of me completely eliminates the temptation. Fortunately for me the sun and warm weather are back and the terrace season is opened. The answer to that question is limited only by our imagination, and each one of us will have a different way of answering it. Some of us will respond instinctively, others will analyse the glass, trying try to calculate where the 50% mark lies, so that they can give an accurate answer. There will be others who will try to figure out why you are asking that question in the first place, in order to come up with the answer they think you want to hear. Each one of us will process the question in a different way. This happens because the sum of our life experiences is what drives the response process. We all have different frames of reference. That, amongst other things, is what makes us individuals. Although we all share similar emotions, such as motherly love, anger, rejection, success, pride, etc., the environment, timing and context in which we experience these emotions is different for all of us. This makes the mental imprint we have of that experience unique. It is precisely these experiences that we then use as filters to process situations and information during our lifetimes. A child has a relatively clean mental slate, and it is easy to understand the weight and importance that these mental imprints can have on a child’s future. When and how this happens early in life makes a huge difference to a child’s potential. In his book Outliers: The Story of Success, Malcolm Gladwell talks about the story of Lewis Terman and his still-running longitudinal study called the Genetic Studies of Genius (known today as Terman Study of the Gifted). Terman was convinced that geniuses (people with an IQ higher than 140) would achieve great things in their lifetimes. As it turned out, all he was able to prove was that, when it comes to their achievements in life, geniuses are also normally distributed. However, when the data is segmented in a different way, it shows a clear correlation between social class and academic performance. This is related to upbringing and the tendency for well-to-do families to encourage and support academic education, whilst the socially disadvantaged parents generally have little time to encourage and support their child through education, and in some cases may even be ashamed that they themselves do not have an academic ability. We all see the world through different eyes, and no two eyes are the same. When we answer the question about the glass of liquid filled to 50% capacity, not only is the process of answering different for each individual but also it all happens in the blink of an eye. So what gives us the ability to do that? Well, it’s our brain, of course, but more interesting it’s the duality of our brain. On the left side of this organ there is the rational part that thinks through problems and structures thoughts – this part will filter the challenge itself, in terms of physical and factual data. On the right side is the emotional part that filters a different type of data: body language, context, company, etc. Each part plays its role in transforming this data into information on which we make a choice of responses. Whilst we have the ability to think rationally, we are driven by emotions. This is why in the US supermarkets when you get your receipt you see in big letters how much you’ve saved, while the total of what you’ve spent is in normal text – they want to make you feel good about how much money you have saved at their store, never mind that you’ve maxed out on your credit card! Modern psychology has made a lot of progress trying to understand how the two sides of the brain function and complement one another. There have been many analogies used to describe the tension between the two halves, but perhaps the most vivid is the one used by the psychologist Jonathan Haidt (Professor at New York University Stern School of Business) in his book The Happiness Hypothesis. Haidt sees our emotional side as an elephant and our rational side as its rider. Sitting on top of the elephant holding the reins, the rider may give the appearance that he is in charge, but, in fact, if the elephant were to see a mouse or be in any other way scared, it is quite clear that the rider would not be able to hold the elephant back, no matter how hard he pulled on the reins. It is precisely this tension between the rational and emotional sides of our brains that makes it so difficult for us to change. The elephant side is instinctive, and always on the look out for instant gratification. The weakness of the elephant is the rider’s strength: the ability to plan long term – the knowledge that calories saved today will enable me to lose weight. Put another way, everyone knows that smoking is bad for you (rider), but getting the elephant to stop procrastinating and coming up with excuses is difficult indeed. The challenge is for our riders to keep the elephant on the path long enough so that we can reach our destination. To achieve this the rider needs to resort to tricks, such as avoiding people who smoke when you are trying to stop smoking, or strategically placing a device that makes pig noises every time you open the refrigerator door. There is no strict recipe for this: everyone is wired differently, every situation will require different measures and certain things will work for some people but not for others. It is important to recognize that the rider needs to and can manage the elephant – even if this occasionally requires putting a blindfold on the elephant’s head. Learning to manage our elephant is not that difficult: the rider needs to observe how the elephant behaves, orchestrate life with fewer temptations and reward the elephant for every step it takes in the right direction. After all, gratification is what it is craving! How much baggage do you carry around? As I continue to think through the time question I have realized that there just is so much to cover. So the upcoming posts will be related to optimizing and helping you make the most of the time you have. The beauty of this is that you decide how you use the tools and what you do with your time. Whichever way you decide, the whole point is to make you aware. If you followed the last post and did the exercises you will now be more aware of how you spend your time. And like every thing in life, some things are relatively easy to fix others require fundamental change. Today’s segment is of the fundamental type, as I believe that building on a solid foundation, ultimately provides longevity and sustainability. Rule number 1 – the more stuff you have the less free you are. Every material thing, not only takes up storage capacity and effort (cleaning moving around etc. ), it takes up brain capacity and processing power as well. Think about it for just about every thing you posses have it’s own story: where it came from gift bought when where with whom etc. So all that stuff in the attic, although out of sight is not out of mind. It weighs on you without you realizing it. Sometimes letting go of stuff can be emotionally wrenching, I know, I still got stuff from the seventies and I’m a pack rat by nature. Nevertheless sorting through your stuff it’s easy to keep the emotional stuff and get rid of the other stuff. To do the sorting, I have developed the 4 G approach: Good to keep, Give to someone else, Garage sale, Garbage. You should run through the cycle at least once per year and your “Good to keep” pile should not be getting bigger (and unless your income is expanding at the same rate, chances are you are over-consuming). I have shrunk my to good to keep stuff to a large oversea trunk. When I pass away I know that my kids will have a laugh at all this junk that has sentimental value to me and no one else. But one trunk over almost fifty years that’s not bad, I guess? Let me tell you the story of a client I had and for the sake of anonymity we will call him Fred. He was an engineer in his fifties and having being part of the original new hires during the construction of the site he was now the operations manager in a chemical plant. The man was brilliant and he had a fantastic memory, we could be talking about a subject and he would say A yes, I attended a conference 4 years ago, hold on a minute I’ll be right back. He would then stand up and leave the meeting we were having, only to return 3-7 minutes later (his office was down the hall). Upon his return he would show you the documentation from the conference and get completely off topic. As you reeled him back and got back on the subject, something else would pop up and he would be off again! This guy was a walking encyclopedia but you could not get him to focus on anything. Although he was a hard worker, came in at 6:00 and was usually the last to leave after 20:00. His spent the entire day on the shop floor, something rare for someone in his position. As our project evolved we quickly realized that something was wrong with Fred. His un-ability to concentrate was affecting his work performance, besides something else was weird about Fred. No one had ever been into his office. None of my colleagues, or even clients we asked, could ever remember having been in his office. Ok I know what you are thinking, what about his boss, the plant manager. Well that’s another story, his had an alcohol problem and was fired 2 weeks after we started our project. Anyway I doubt whether he had been in Fred’s office either! I made it my mission to discover the mystery that was his office. Since he loved to recount memories and look up stuff, I engaged him in this way and slowly broke down his barriers through my curiosity and interest. One night, in early December as we were working late, I noticed the light on in his office and I decided to pay him a visit. As I knocked on his door I heard the shuffling of papers and his voice telling me to wait a minute. He opened the door slowly to see who it was and seemed surprised to see me. I told him I had seen the light in his office and wanted to stop by to show him the new management report I had been working on. With nowhere to go he quickly open the door and closed it quickly behind him before leading me to the conference room down the hall. However he quickly realized by the look in my eyes that I had seen enough off his office to give him away. Even though he pretended to not to notice, I could see I had unsettled him. As we went through the report, he suddenly burst into tears, and when I say burst I mean literally did burst with tears sprinkling all over my report. I stood up and walk out to go to the washroom for some tissues. When I came back with toilet paper he was gone. That was the last time we saw Fred. He did not come back to work and ended up in a mental hospital. Later we learned that he had suffered from, amongst other things, what was referred to as information overload. I spend a good deal of time on the Internet looking for a picture that would represent his office. The one I found does not really do it justice, his office looked worst simply because his office was bigger and the path through the piles of documents was longer and interspersed with the odd plant. 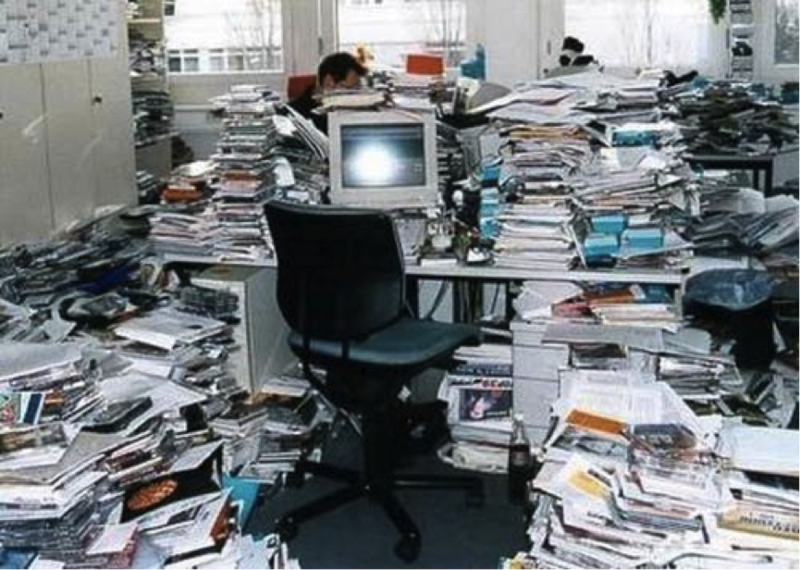 Courtesy of http://www.rentittoday.com/rental-blog/5204/inception-technologies-document-scanner-rentals-us-canada .Electronic document solutions so your office doesn’t look like this! Most people’s office does not have the chance of getting like Fred’s. His was a particular situation, and living alone he must have subconsciously known this was not normal hence his reluctance to let anyone in his office. In any case, it was a hard lesson on me as I was the one who delivered the wake up call. How do you know when your time has come…? Chances are, if you are asking the question yourself this question, your time has already come; it’s just waiting for you to make your move. So why don’t you? Well as we have learnt in my last blog (The individuality of duality), it is most likely that your elephant is holding you back. If you remember the elephant is in charge of “now” and unfortunately “now” is when action happens. Your rational side, the rider can come up with the best ideas and make great plans, it’s all in vain if you can’t get our elephant to take action and stay focused on the task at hand. Perhaps the best way of illustrating this is to tell you about my current internal debate. My rider has planned that I sit here now and write (because it’s early in he morning, I feel at my best, it’s quiet and I’m comfortable). My elephant is restless and is constantly bombarding me with ideas of other activities that need doing and would be a lot more gratifying write now. So how do I manage this debate? I breakdown my plan into small steps and reward my elephant with gratifying moments every time I accomplish a step; in my case completing this page or paragraph before making another cup of coffee. I need to stress that there is not one recipe for this. Each rider needs to learn what works best with his elephant and every situation will demand different steps and rewards. However if you understand the dynamics of rider and elephant, you will quickly see patterns of this dynamic in your own behavior. Opportunities will emerge that you can use to tame your elephant and set you back on your path. It makes total sense, if we stick to our example, it could not be easier for the rider. The path he wants to follow is a breadcrumb trail for the elephant. Because passion means emotional engagement, what for someone is work is for someone else fun. Following the path naturally satisfies the elephant’s hunger for gratification, thereby minimizing the efforts of the rider. You may say that this is great advice for kids entering high school, but not practical for 50 year olds’ who are approaching the sunset of their careers. Of course you are right, however I believe that it’s never too late to change, by the time you are fifty, you should be well aware of what you like and what gives you pleasure. If you are not doing this for a living than it may be too late to change careers, but it’s probably not too late to reorient yourself in a position where you can make use of your work experience to date and do something else that will bring you closer to your passion. And don’t feel bad because the 15 year olds’ may still have a lot of time ahead of them but it is rare that the already know what the are passionate about. Basically for employees to be satisfied they need to understand how their role or position is linked to the organisation’s vision and mission. They need to constantly be reminded of the importance of their work as to stimulate their sense of pride. The opportunity to contribute is obvious, who wants to work in a place and be considered a robot. You may have heard some of these classic statements: “ just do what you are told” or “you’re not paid to think, you’re paid to produce”. Although this one seems obvious, you would be amazed how many times, in my 20+ years as consultant, employees complain that the issues we identified through our observations and analysis have been known for years but no one does anything about them. 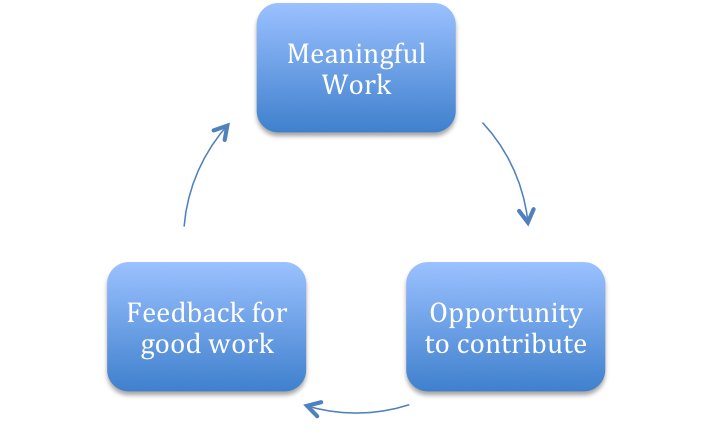 Finally, feedback for good work, again this may seem obvious but a lot of companies have not even defined what good work is, so it’s difficult to measure against it. As for feedback, let’s not talk about your direct boss that you probably see every day, what about your boss’s bosses? Can you remember last time you saw them, let alone received feedback from them? However, before you can answer: How do I know my time has come? You will first have to fill in the blank “my time has come … (to what?) : look for another job? Ask my girlfriend to marry me? Start exercising? Have another beer or position myself in front of my boss? Start a change program in my company? Start my own business and follow my passion. However you phrase it, your answer will ultimately lead to change. They have also developed a very simple but effective employee questionnaire that can be used in association with organizational maturity model. The company had been experiencing difficulties. After years of changes in it’s sales engine it was not getting traction in the market and as a result was not growing. Well there were some good explanations: the 2008 Financial Crisis, the Euro debt crisis, industry cycles etc. However things started to go astray long before that. People familiar with the company will tell you the company reached its peak shortly following the management buy out. Which of course one could say was good for the management behind the buy out and potentially bad for the banks and investors, at the time. Of course that is easy to say now, with hindsight we know there were changes in leadership and management. We also know we lost talent along the way and all too often theses talented people in turn set up their own competitive business or strengthen the racks of the competitors. What is interesting is the dynamics of the decline. A classic tale of austerity! As the company fails to meet expectations year after year, the investors get more and more worried so they get more and more involved, over time filling key positions with trusted people, who don’t necessarily have experience in the business. These people then take decisions without the full understanding of what makes the company successful. So we start with the classic track: Expenses need to be reduced. As the one big-ticket item, management first delays the annual regional meeting and celebration (European Company Meeting). The event is a celebration for all the hard work and success stories we individually, or at least as project team, experience on projects. It is also often the only opportunity many people will have to meet there colleagues from other offices and build their networks. Above all it is an opportunity to share and bond together, thereby releasing and incredible amount of energy that always lasts until the early hours of the morning. At first it is just a 6 months delay, then slowly but surely it becomes an, “every two year event” and finally becoming and exception. Unfortunately it is people that make up the assets of the company and thinning out the so-called “ECM” may seem like a wise thing to do, unfortunately it undermines the very fabric of the company. Of course the annual party is not the only expense that is cut back. Since operations make up 90% (or at least it should) of the workforce it was decided that “Non billable expenses” are to be eliminated in operations. The logic being that operations people work on projects where clients pay the operational expenses. This policy was effective in two ways: it reduced expenses and thwarted all other operational activities that one couldn’t morally expense their clients. Training some became the next victim of eliminating non-billable expenses. During it’s peak the company invested a lot in training, in fact I was personally involved in upgrading our training initiative, taking the ownership for the “Operational Fundamentals” course in 2005 and delivering the course 9 times to roughly 200 new starters until 2009, when training was sacrificed altogether. But in the end these cuts are not enough, now the company has started cutting personnel. The company is downsizing and to be sure it has the biggest impact on its payroll, it is the people with the highest salaries who are targeted first, never mind that they have the most experience and knowledge. That’s how I got my notice the other day, yep after years of dedication I had finally become a number on a piece of paper, someone who was perceived as “non value add”. At first I was shocked, but then, thinking all this through, I realized that my time had come. If the management did not see the need to keep me around then why would I want to stick around? It is kind of paradoxical that the company that preached “linking the top floor with the shop floor” has itself become so disconnected. Quite frankly I’m happy I got laid off, because it’s no fun to work where you don’t feel appreciated. So “adios” old job! And hello new opportunities! To stay true to my motto of “ helping people”, I have decided to share my experiences, ways and methods, to look at, and deal with change, both personally and organizationally. You see I have learned that change does not have to be painful and it does not have to be hard. After all, the essence of our being, the cells that make up our bodies, are constantly changing. And just as a year is made up of changing seasons, our lifetimes on earth are made up of different chapters. Evolution is change! Yes learning something new does require more mental effort, but it can also be rewarding so whenever you are faced with a life changing event don’t be afraid. Just because it “looks like” you have been dealt a lousy hand, does not mean you are out of the game. Who knows if “what looks like a lousy hand” turns out to be the best hand at the table? You have to make the best out of what you have, and as Marcus Buckingham and Curt Coffman have wonderfully captured in their book “first Break all the rules”, stop focusing on trying to repair yourself and start focusing on what you are good at (what you enjoy doing) because that is what you will excel at. Getting laid off is kind of like coming to a “ T ” intersection in life. You can turn right or left, you just can’t go straight! It provides an opportunity to truly assess ones life and take a different turn. Many people are not given that opportunity and continue doing a less than satisfying job until the day they retire. Why? Because they themselves are afraid of changing, they are reasonably comfortable with what they have. So just like Greece, the company is stuck in a negative dynamic current, brought on by austerity. The mismanagement of the past has to be paid by the citizens / employees of today. Unfortunately focusing on reducing expenses and costs does not help generate more revenue. The glass is always half full or half empty depending, which way you look at it. Picking your way to look at it will decide, like the intersection in the road, where you end up. Are we seeing the start of a democratic revolution? Could trust become the new currency of the century?